U.S. ratings agency Standard & Poor’s has confirmed Russia’s credit rating as investment worthy following a week of speculation, causing the Russian stock index to pick up and the ruble to rebound briefly on Oct. 27. However, fears remain that economic instability may lead to the agency downgrading Russia’s rating in the future. American ratings agency Standard & Poor’s has confirmed Russia’s investment-grade credit rating as BBB- with a negative outlook. According to S&P analysts, the sanctions imposed against Russia have not impacted its creditworthiness. However, economists forecast that the rating would be lowered to “speculative” a week before the announcement, which undermined the ruble and stock indexes. The Russian ruble slumped amid the negative expectations, reaching a new record of over 42 rubles to the U.S. dollar and 53 rubles to the euro on Friday, Oct. 24. Both the ruble and Russian stock indexes picked back up on Monday, Oct. 27 as a result of the positive news. By 11:15 a.m. Moscow time, the MICEX index had risen 1.5 percent, while the dollar-denominated RTS index had grown 1.35 percent. However, by evening the ruble had fallen back again. “The fact that the Russian rating has been kept at investment level is definitely positive news for us. The shares of many Russian companies are at oversold levels, so the rating being held is an excellent opportunity to make a long overdue upward correction,” leading analyst at broker FBS Kira Yukhtenko told RBTH. 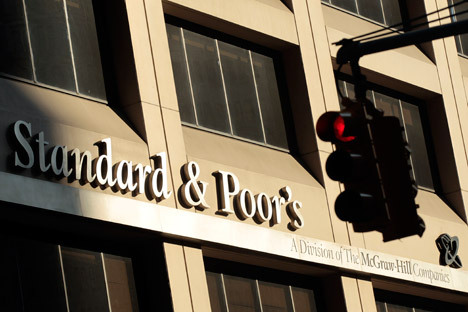 S&P said in a statement that the ratings reflect the Russian economy’s net external asset position and the government’s modest net debtor position. S&P expects this trend to persist in 2014-2017. Specialists at the agency assume that the sanctions will be kept in place against Russia because the conflict in Ukraine has yet to be de-escalated. In S&P’s opinion, the primary risk to the rating is not external constraints, but a deterioration in Russia’s economic situation and the budget’s growing dependence on oil and gas revenues. The Russian Central Bank’s willingness to support liquidity in the banking sector also helped Russia keep its rating at investment grade, Russian Finance Minister Anton Siluanov said after the S&P report was released. In his opinion, the ratings agency saw Russia’s key strengths as a borrower. Citing a lack of “objective” reasons to revise the country’s sovereign rating, Russian Economy Minister Alexei Ulyukayev previously said that it would have been “biased” on S&P’s part to have downgraded Russia. On October 18, ratings agency Moody’s downgraded Russia’s sovereign rating to Baa2, which is the last grade in the ‘investment zone’. Analysts had anticipated that S&P would follow suit. Kira Yukhtenko is of the opinion that S&P made a logical decision. “Despite rising external pressure and internal structural problems, the Russian economy will remain relatively stable in the short-term. Current oil prices, although not too comfortable for Russia, are still allowing it to preserve a balanced budget,” she told RBTH. However, she said Russia’s rating is still likely to be downgraded in the future. According to Chief Economist at Bank of America in Russia and the CIS Vladimir Osakovsky, as cited by RBC Daily, Russia should only expect a downgrade next year if the economic decline continues. Sberbank CIB analyst Tom Levinson, meanwhile, thinks S&P would find it difficult to justify another downgrade in light of Russia’s macroeconomic indicators, including a low debt level (Russia’s external debt is at 2.8 percent of GDP).